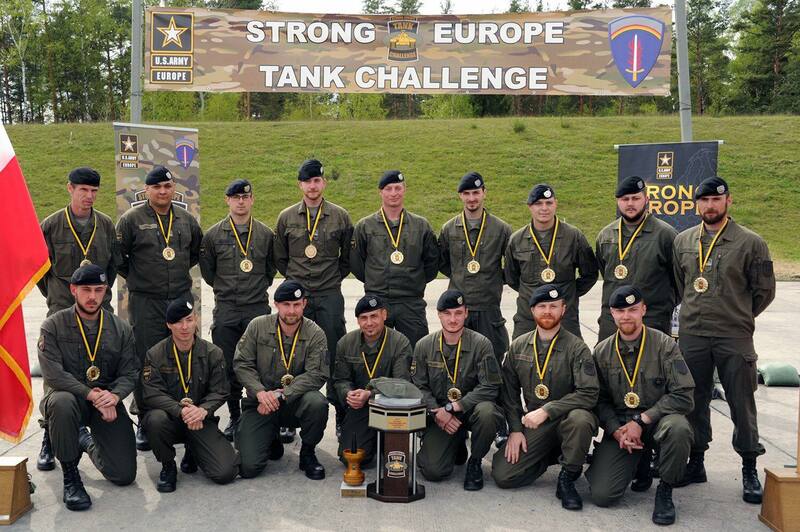 Two days ago the Strong Europe Tank Challenge (SETC) 2017 ended. The winning platoon comes from Austria, one of the first time participants. The soldiers of the Austrian Bundesheer deployed the 1980s' Leopard 2A4 main battle tank (MBT), beating last year's winner Germany. In the challenge held from 8th to 11th of May, teams from Austria, France, Germany, Poland, the Ukraine and the United States tried to show their skill in a number of different disciplines. These included offensive actions, defensive actions, target recognition/identification of thirty allied and enemy targets, estimating the range to a target without using the laser rangefinder, accurately reporting targets in a simulated urban area and firing crew weapons (pistols or submachine guns). Also part of the SETC was to recover a tank with simulated damage from an NBC attack, evacuating and treating wounded, calling for fire support by artillery/aircraft and precision driving along a pre-defined track. Crews also had to endure a physical fitness test. In comparison to last year the scoring was changed. As expected, the top ranks were occupied by the Leopard 2 tanks; last year the three top-scoring teams were all operating the Leopard 2 tank. That the older Leopard 2A4 managed to beat the sixteen years newer Leopard 2A6 gives a lot of reasons to speculate. It shows that the Leopard 2A6 tank (just like the Leclerc and M1A2 MBTs) probably could not make full use of their more advanced optics, as no night operations were tested. The Leopard 2A4 - fitted with only a single, older thermal imager - should perform a lot worse than these tanks. The limited range during firing trials also makes it impossible for the German and French crews to make full use of their longer barreled main guns. However there is also another major factor for the Austrian victory: crew training. 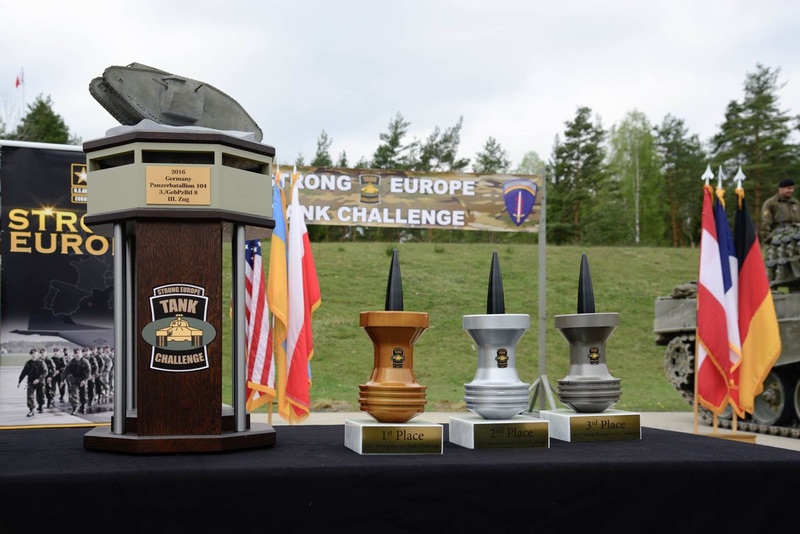 The Strong Europe Tank Challenge is not meant to be an evaluation of the technical characteristics of a main battle tank, but instead tries to measure how well a platoon from a country can perform with it's own equipment. The Austrian crew won, because they were the best trained crew (or rather: they could make the most use of their training). Based on a photo from a score sheet, that was taken during the competition, the Austrians managed to perform best in calling for fire, the highest scored part of the competition. The Austrian crew got 696 of 700 possible points, while other teams such as the Germans and the Poles got only 500 and 450 points respectively. The Leopard 2s managed to get the best results in offensive operations, which might be related to the high quality and performance of the Leopard 2's fire control system (FCS) and optics. The platoons manning the Leopard 2A4 and the Leclerc tanks both managed to get the fastest time in the precision driving challenge; both these tanks happen to have the highest power-to-weight ratio of the competing models. This should give some of the tank designers a reason to think, if upgrading the engines shouldn't be a priority for the future, specifically after armor upgrades lead to an increase in combat weight of tanks like the M1 Abrams and the Leopard 2 by more than seven metric tons. According to the US Army's own news report, there were different 12 events/challenges in the SETC 2017, which allowed for a total score of 1,500 possible points. However official data from the Austrian Army (scores during the competition, not all teams have finished the same amount of tasks) and the photo from a score sheet during the competition suggest that there were more than 1,500 possible points. Unconfirmed rumors from an Ukranian websites suggest that the French team with the Leclerc MBT managed to get the fourth place, while the Ukranian platoon - operating an upgraded version of the T-64BV tank (sometimes described as T-64BM) - got the fifth place. These tanks were fitted with new radios, GPS systems and night vision optics before being send to SETC 2017. Apparently the crews managed to beat other Ukranain soldiers with T-64BM Bulats and T-80BVs in a national competition before being send to Germany. Supposedly the Polish team with the Leopard 2A5 was on the last place, something that has been blamed on poor training; last year the Poles managed to outperform all but the Danish and German crews. Based on the score sheet from during the competition the Polish crews apparently underperformed in the recovery of a damaged vehicle in a CBRN scenario, in precision driving, in calling for fire, in identifying vehicles and in determining the range. Other claims to justify the poor performance of the Polish platoon say that the fire control system of a single Leopard 2A5 broke in such a way, that the crew couldn't repair it. However the Polish press claims, that they managed to get the fourth place, beating the French and the Ukranian squads - it might be possible, that after the challenge a modifier was added to compensate the lack of a single tank. According to claims from the US website Stripes.com, all scores are rather close to each other. In 2017 the US Army had only one single platoon competing in the Strong Europe Tank Challenge; previously two US platoons tried their best to win the trophy. Back then the M1A2 SEP v2 tanks managed to only secure the fifth and sixth place, beating out only the M-84s of the Slovenian platoon. For the second time in a row, the US Army used the most modern of all tanks (the M1A2 SEP v2, which first entered service in 2011), but again failed to beat at least some of the Leopard 2 users with much older hardware. This means that the either the training of the US tank crews is lackluster, or that the M1A2 SEP v2 still requires some work in order to reach the same level of performance as the older German designs. Based on the very few known scores, the US tank platoon did perform slightly worse in offensive actions (gunnery, target spotting) than either German-speaking team, while also being a lot worse in precision driving. Specifically the offensive actions should be among the events, that are most affected by equipment. The runner-up of the SETC 2016, Denmark, couldn't afford to participate. 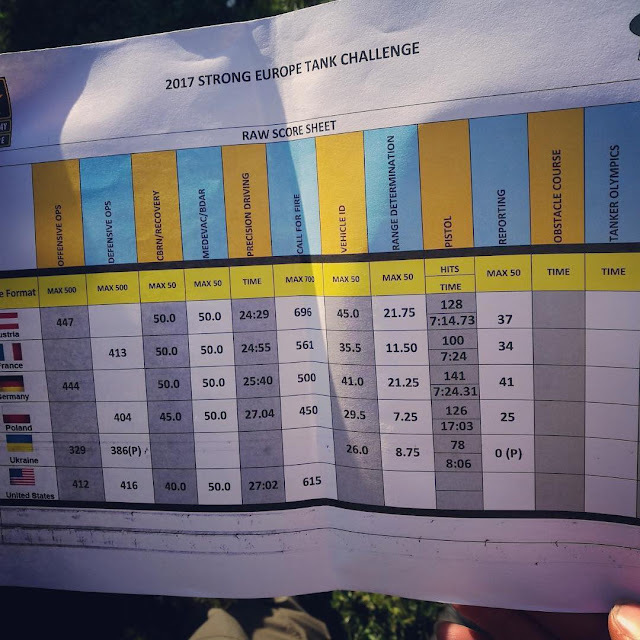 The Strong Europe Tank Challenge is rather expensive, it not only requires sending four tank crews, but also four tanks, to Southern Germany. Denmark instead decided to compete at the Worthington Challenge in Canada and the Nordic Tank Challenge in Scandinavia; both these competitons require only two crews, while tanks can be leased. Next year Sweden will compete in the Strong Europe Tank Challenge, probably with an upgraded version of the Strv 122; there are hopes that the United Kingdom with the Challenger 2 and Canada with the Leopard 2 (2A6 or 2A4M) will also be part of the Strong Europe Tank Challenge 2018. When will Russia and/or China join the SETC competition? Thank you for the information. I left a credit for you. The question in these types of competitions, going back to the Canadian Army Trophy, is how much time did the winning team have to train specifically for the events, and were they exempt from other mikitary duties? The US team from the 4th ID is in Europe as part of a six month deployment. Just a month ago they were in Poland doing maneuver training. my guess is the Austrians worked on this for months, maybe longer. I never heard of the Europe Strong Tank challenge before and therefore I find this blog to be adequately informative. United States seems to be taking up the challenge well and I know that with time it can be at the top. I have known that Masters Dissertation Writers would prefer to even share their concepts over such platforms.